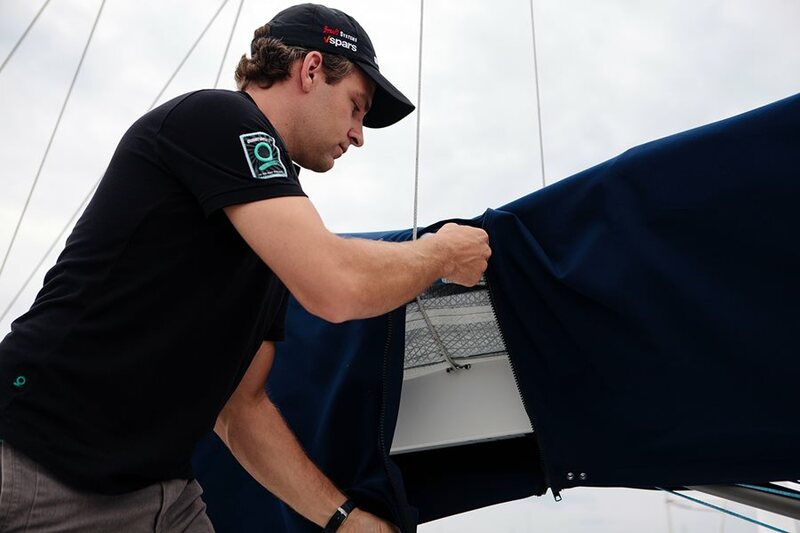 The first in a series on sail handing systems, Quantum’s expert David Flynn dives into the options for keeping – or getting – a handle on your mainsail. It's ok to be Lazy - Lazy Jacks (shown here) are a great way to tame and manage your mainsail. to sail. Over the past two decades we have witnessed a revolution in sail handling systems making the mainsail much easier to manage, especially for rigs with larger mainsails. Here’s a look at some options for your mainsail. The first issue in dealing with any conventional mainsail is controlling it when it comes down. Luff slides will keep the front edge attached, but the rest of the sail will be all over the place. The easiest way to address this issue is to contain the sail as it drops with lazy jacks. Lazy jacks are lines arranged in a bridle or series of bridles (depending on length of the boom) running from the boom to the mast (usually attached about 50% of the way up the spar). The sail comes down between the lazy jacks and stays more or less on the boom. Flaking and putting a cover on is still a chore, but the lazy jacks will keep the sail under control until this is convenient. Lazy jacks work better with fully battened sails because the battens make it harder for the sail to fall out. The mainsail cover will have to be adapted with slits and zippers to allow it to fit around the lazy jacks. Lazy jacks also can make it a little more difficult to raise the sail since it has to be guided between them as you hoist. The boat will need to be perfectly headed to wind. One way to keep the sail on the boom and under control is to use a wide boom section. The so-called “Park Avenue” or “V” booms keep the sail on top when used in combination with lazy jacks. As boats get bigger, sails get heavier and harder to flake and booms move further up and away from the deck; simple lazy jacks may not be enough. The next step in simplifying the process is to integrate a sail cover with the lazy jacks. Sold under various brand names (Quantum’s is the SailPack), these integrated covers not only contain the sail, but also guide it down into the cover where it can be zipped closed. Flaking is not a real concern; the sail just piles up inside the cover, which is made with plenty of room. Reaching the zipper can be difficult; systems using remote control lines to pull the zipper can help, but add complexity. Integrated covers are really popular on multihulls with hard dodgers where you can simply climb out and get the zipper. Another alternative is the Dutchman. This is basically a series of control lines that are integrated into the sail passing through a row of fittings going from one side to the other. At the bottom they are secured to a “tab” that is sewn into the foot of the sail. At the top they are attached to the topping lift. As the sail comes down it is not only contained, but also will flake itself to some extent. Usually some straightening at the back end of the sail will clean up the flake job. A standard sail cover with slits and zippers (as with Lazy Jacks) is used. Another nice feature of the Dutchman is that there is no issue of interference when raising the sail. This system works well on small to medium size boats and adds another layer of convenience. On the largest cruising boats or for those in search of the ultimate in push-button, never-leave-the-cockpit control, the alternatives are in-mast or in-boom furling. In-mast furling is probably the easiest and most reliable system. Essentially a headsail furler stuck inside the mast, it can be reliably operated from the cockpit (usually using a powered winch). Furling mainsails are inherently difficult sails to build. Without a conventional batten structure, compromises to both size and shape must be made. Sail size is usually around 20-25% smaller for the same luff and foot length. Since the battens support the sail’s area outside the straight line between head and clew (the roach), furling mainsails are built like headsails with leech hollow. To furl well inside the limited space of the mast cavity, the sail’s shape also must be quite flat, with minimal luff curve. Control of sail shape via mast bend is not possible. Without battens, there is no structure to resist compression and keep the leech from moving toward the luff under load. This causes the sail to get fuller just when one would like to see it get flatter. The leech will never be as straight and clean as a batten mainsail and there will typically be some curl at the edge. If performance is a primary design criteria in-mast furling is probably not the best option, but you can’t beat the ease and safety of operation. To provide better shape and performance, vertical battens can be used. While vertical battens help, they can also create problems. The cavity size and width of the mast opening are important factors in determining if battens will work; battens add thickness to the sail and can make the sail difficult to roll in and out of the cavity. The pockets are also built-in sources of chafe and will require maintenance over time. Vertical battens can reduce leech curl and allow for a small increase in area, but they can’t address the compression loads that cause a sail to get fuller under load. If you are going to add vertical battens, be aware they can potentially compromise the best asset of in-mast systems: the simplicity and reliability. Modern in-boom systems are not just headsail furling systems adapted to the situation; they are designed from the ground up for the job. They are made with a rigid mandrel set inside a hollow boom. The foot of the sail is attached along a portion of the mandrel; the tack and clew are secured at either end. A special feeder guides the luff of the sail into a sail track attached to the aft face of the mast. The mandrel is driven by a powerful drum; the line control for the drum is typically led aft on the deck alongside the mainsail halyard. Electric or hydraulic winches are used for the mandrel control line and the halyard (the control line when furling and halyard on the hoist). The beauty of in-boom furling is not just in never-leave-the-cockpit ease of handling, but in the sail itself. A full batten structure is used which allows the designer to create a full-sized sail, with as much roach (area outside the straight line between head and clew), as the sail needs. Sail shape, while it must be tailored to the demands of the system, is as good as a conventional sail. Shape can be controlled with mast bend and by partially furling the sail. In-boom systems do take more attention to detail when using, especially when lowering. The trick is to get a relatively uniform roll of the luff underneath the feeder. This is a combination of setup (boom angle, tack position), but is also relies on the operator. The rate at which the mainsail halyard is eased is critical. To help make sure everything goes smoothly you need to watch what you are pulling on, keeping the forward end of the roll in sight as you furl so you know how much drag to put on the halyard. This means that the control lines need to be setup with a clear line of sight to the forward end of the boom. Finally, because they go up and down on a regular basis, wear and tear on the luff tape and forward end of the battens is normal and regular maintenance will be required. If you are willing to accept these limitations, in-boom furling provides the ultimate balance between no-compromise performance and ease of use. Any of Quantum’s sail consultants or service managers will be happy to answer your questions and discuss the best sail handling options for your rig. Adding a sail handling system does not necessarily mean a new sail. Quantum’s service department offers sail conversions making it possible to continue using your sail with a new system. Contact your local representative or find a loft here.